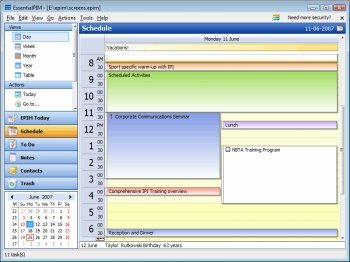 EssentialPIM handles all your scheduling, contacts, to do lists, and notes with easy-to-use, intuitive tools. This absolutely free personal information manager can store, manage and encrypt data: day/week/month/year schedules, to do lists for keeping all your tasks up-to-date, notes (pictures, tables, any formatted text), and contacts. Offers Rijndael 128-bit encryption, MS Outlook import/export, search capabilities, versatile print features, and adjustable contacts storage with unlimited fields. Works straight from USB flash drives. Blaxima, NOD32 has a false positive on this one. EPIM does not include any adware or malware. mchargue, You can download NON-U3 portable from our website. Like the app, but don't like that the portable version has to be installed on a 'U3'-compliant USB memory stick. probably a variant of Win32/Statik potentially unwanted application	connection terminated - quarantined	Threat was detected upon access to web by the application." "I find random blank boxes for some of my repeating tasks. Well it seems I stand corrected. I said that it only showed blank boxes for my old databases but after redoing EVERYTHING in a new one I find random blank boxes for some of my repeating tasks. Works great. Very polished. Being stuck with email I simply use tbird portable with the lightning plugin. I have the same issue as Blaxima. The empty task boxes is so damn annoying. I also don’t like the new interface that much, but I guess that’s because I’m so used to the old v1.95 interface. I also liked some old v1.95 quirks, such as clicking on the calendar date and then using the arrow keys to scroll through the calendar with the tasks all displaying as change dates. The new version doesn’t have this quirk. My biggest problem however is the empty task boxes upon database conversion. This is such a big issue for me that I’m sticking with v1.95 until its v2.0 reaches about v2.5, by which time I’ve sure they will fix this problem. Good work on the new version, but its just not as fast and reliable as the old version. When I save and load from USB, the old version is so much faster, its easily noticeable. This has always been a 5 BUT when I load an old database it converts it with no troubles until I restart the program. The boxes for the tasks are there but no text and when I click them it has no info on the task. A mistake like that shouldn't be in an alpha version let alone a "finished" one. the best PIM i know and it is free & portable !!!! A superb, many-featured, stable, easy-to-use PIM. And FREE!!! couldn't ask for me & don't want to.